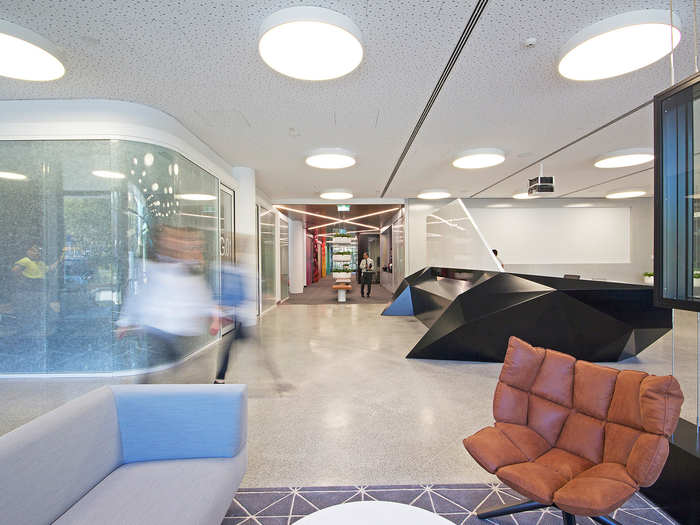 PTID has developed the offices of global technology manufacturer Canon located in Sydney, Australia. The design brief was to create a new home for Canon that would reduce floor space, energy consumption, and provide scalable accommodation at a modest price. The aspirational aspects of the brief were to increase workplace attractiveness, enable a flexible and collaborative workplace, align the physical workplace with Canon’s masterbrand values and act as a showcase for Canon technologies. The Leadership qualities expressed in the Japanese concept of San-ji also informed the design thinking. These included Imagination, Bravery, Togetherness, Achievement and Integrity. Materials have been selected that, in their natural appearance, would add warmth and texture without sacrificing their inherent natural qualities and characteristics – plywood, concrete, metal and natural fabrics are plentiful. Late in the design process, Canon introduced a policy of non-assigned work points for large parts of the business who met certain mobility criteria. Supplementing the workstation system are carefully placed collaborative work settings that support those very dynamic micro-communities, ensuring a high level of occupancy and choice of work style. Public spaces are grand in scale and bold in appearance. The Canon space reads as a strong counterpoint to the somewhat bland architectural envelope. The colour scheme contrasts dark and light tones with Canon photographic images in large scale adding impact. Canon’s desire for an elastic workspace lead to a workstation design based on a fixed services spine with movable attachments offering each individual control over the furniture arrangement in a singular space. The system allows teams to create spaces with variable levels of collaboration or privacy according to need. Creating a sense of intimacy on a floor plate of 2700 square metres was a challenge. We have given everybody proximity to day light and views without sacrificing a sense of connection and have also created defined neighbourhoods across the floors giving a “local” sense of scale.